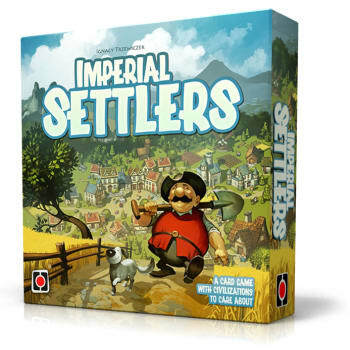 Imperial Settlers is a card game that lets player lead one of the four factions and build empires by placing buildings, then sending workers to those buildings to acquire new resources and abilities. The game is played over five rounds during which players take various actions in order to explore new lands, build buildings, trade resources, conquer enemies, and thus score victory points. The core mechanism of Imperial Settlers is based on the basic concept of 51st State.